2010/11 proved to be extremely successful years and 2012/13 and 2014 brought further commissions and sales. 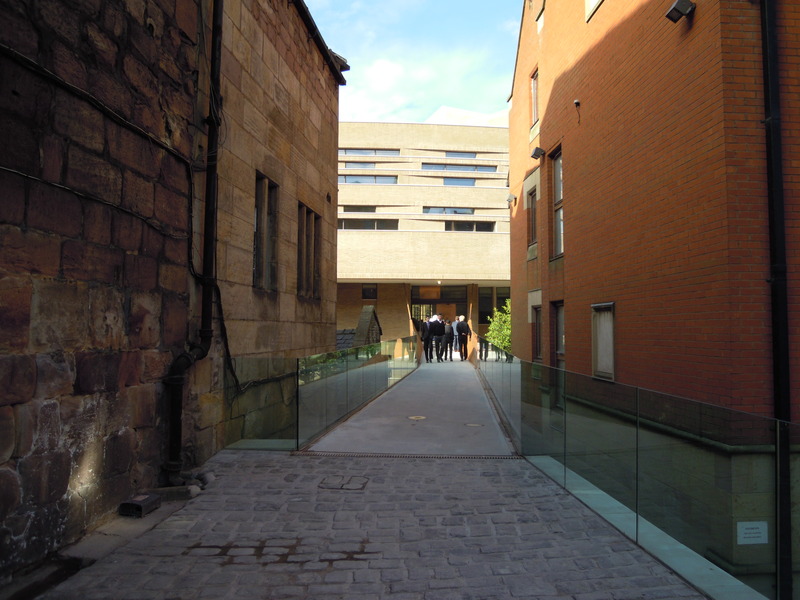 In December 2010 'Construction On Chetham's' an interpretation of Gwilym Simcock's 'Symphonic Construction On Chetham's' was delivered and presented to the school to mark the 2009 celebration of the 40th Anniversary of Chetham's School of Music, Manchester. This painting now hangs in the fabulous new state of the art building which officially opened in 2012. In 2011 I was commissioned by the East Riding Schools' Music Service to create two very large paintings to celebrate the opening of the Hexagon Music Centre, Beverley, in 2010. A brilliant building which provides teaching and rehearsal spaces with first class facilities; this new centre has without doubt transformed the music making experience for the young people of the East Riding. 'Short Ride In A Fast Machine' and 'Finlandia' were officially unveiled in the superb recital hall by the Chairman of East Riding of Yorkshire Council Councillor David Rudd on Monday 9th May 2011. For me, this was a particularly poignant moment, having played in the East Riding Youth Orchestra for four years prior to studying the violin at Chetham's and I felt deeply privileged to have been asked to create two such important pieces of artwork. I was both delighted, and relieved, by the response they received! 2014 proved to be busy and it was with regret that once again I had to make the decision not to exhibit. 2015. I was absolutely delighted to be asked to design a special presentation cheque for the Hilary Steemson Music Award. Hilary Steemson, a former employee of Nottinghamshire County Council Performing Arts Service died after a short illness in 2013. Following her death, her family organised a special legacy award in her memory, to benefit musically talented young people in Nottinghamshire. The legacy, now in its second year, has been won by Seamus Morrison from Newark. Seamus, 14, is a keen drummer from Tuxford Academy. He has dwarfism, dyslexia and dyspraxia. 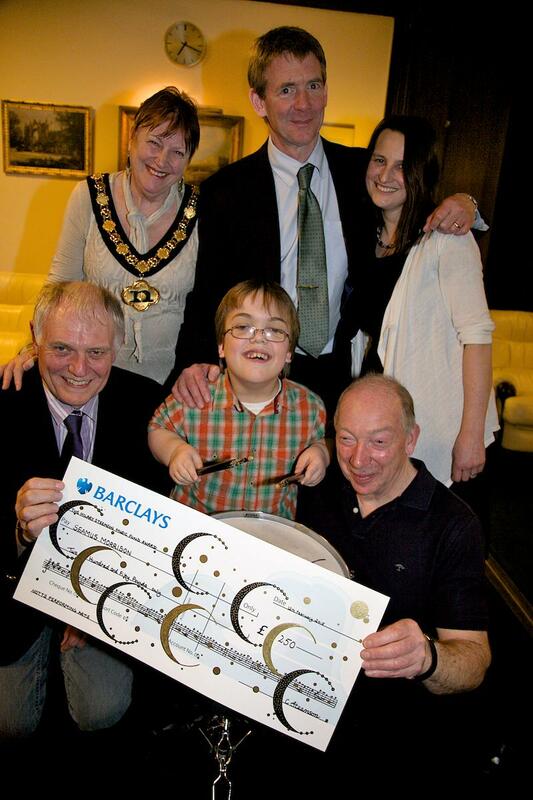 His tutor Gary Haynes, has already created a raised platform to enable Seamus to play a standard drum kit. With the award for Seamus, Gary will work with students in the design department at the school to further adapt the innovative platform to incorporate a cable operated hi-hat pedal, a bass drum pedal and a stairway entrance to the drum kit, which will enable Seamus to access and use the standard kit more easily and unaided. A very worthy winner indeed. 2016.Graham Bentley has been my loyal agent for eight years and continues to successfully sell my work in various locations in the UK. ANN McLAREN HODGSON: BOOK OF PAINTINGS. A Collection of Vibrant Geometric Art. The second, revised and updated edition, is now available to order and features work from 2008 - 2015. Signed Hardback editions. When ordering, if you do wish to have a particular inscription inside, please leave clear instructions. 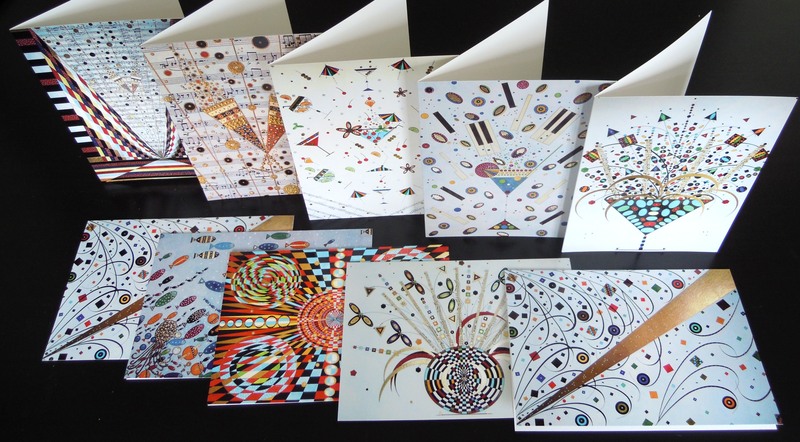 An exclusive, high quality range of Greetings Cards are available to order. If you would like to discuss the possibility of commissioning a painting please contact me by telephone, or by filling in your details on the 'Contact Me' page. 2018. With regret, Graham Bentley, my loyal and trusted agent for the last nine years has decided it is time to 'hang up his hat'. We have enjoyed a wonderful association with many successes along the way and I wish him a very long and happy retirement. 2017 was a difficult year for me with the passing of my dear mother and so I have decided to take a little time out. Please don't hesitate to contact me if you have any queries at all. Thank you very much for your greatly valued support.